Ductless air conditioners can make life a whole lot easier while making your home a more comfortable place to live. DESCO Services provides installation of ductless air conditioning systems to both residential and commercial customers. 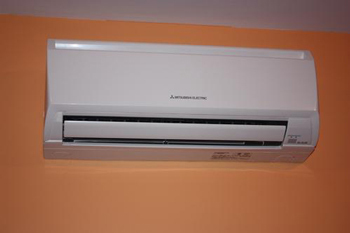 A ductless mini split system is a unit that hangs on the wall and has a refrigerant line that connects to an outside unit. It is an extremely efficient unit that offers both heating and cooling. It is basically a heat pump system. There is no backup electric heat with these units. It is equipped with variable speed compressors and can also range from 13 EER to 27 EER. Ductless heating and cooling systems are almost as efficient as a geothermal system, but without the same high coast. If it is sized and installed correctly, a ductless split system can be the sole heating system or air conditioning system for a home. It is ideal for houses that have areas in which it is impossible to run duct work. It is also a great way to heat and cool a sun room or an addition built onto a home. What is a Ductless AC Unit? A ductless air conditioner is an indoor unit that is actually an evaporator which hangs on a wall. It often has a look that resembles a window air conditioning unit. The ductless split air conditioner includes a coil and blower inside the unit and refrigerant lines running through a hole in the wall to an outside source. For the best installation of a ductless split system, contact the experts at DESCO Services. We can make your installation a quick, affordable and rewarding process. Call DESCO in Hanover at 717-637-2216 or Gettysburg at 717-337-3053 or York PA at 717-846-3384 with any questions or to schedule an appointment.